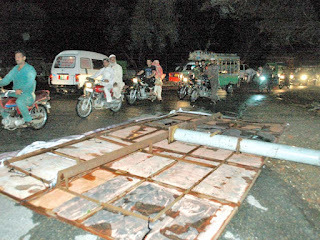 A minor girl died and several people were injured after strong winds followed by a dust storm knocked down power lines and damaged other structures in Karachi on Sunday night. Widespread showers with thunderstorm across the country and a dust storm in Karachi caused by a westerly wave left at least 25 people dead, scores of others injured, and public and property damaged on Monday. Intermittent downpour in western, central and northern parts of the country for the past few days has rendered mud houses susceptible to collapse, while land sliding and flash floods in some areas have already made several roads dangerous for travel. Thunderstorm in Punjab resulted in collapse of several buildings, leaving at least nine people dead. In separate incidents related to the dust storm that hit Karachi in the early hours of the day, four people including two young girls died, an equal number of fishermen went missing and dozens of others suffered injuries, according to officials and rescue services. 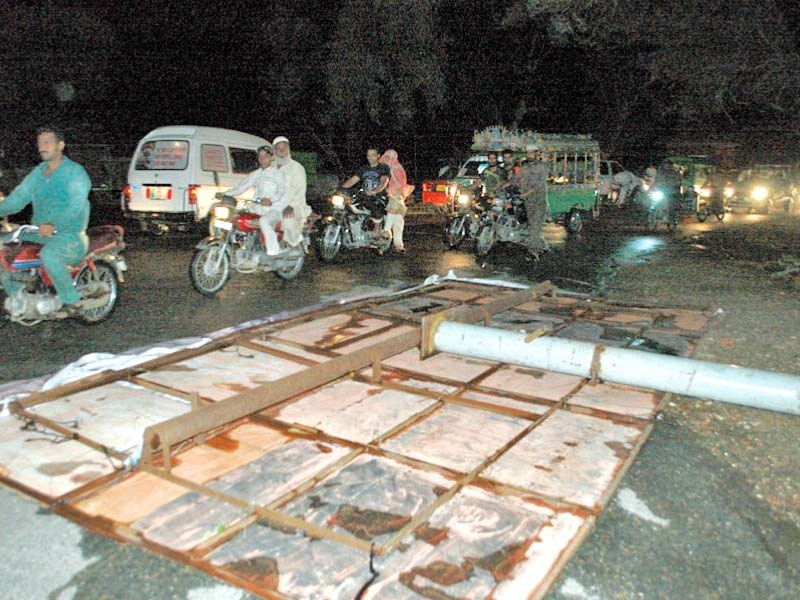 Gusty winds also uprooted several trees, poles and signboards, broke windowpanes of some high-rise buildings and damaged the walls of schools and homes in Karachi. “Two persons were brought dead while another died during treatment,” said Dr Seemin Jamali, executive director of the Jinnah Postgraduate Medical Centre (JPMC). She said the hospital also received over 58 injured. “Two of them had head injuries while some others suffered fractures,” she added. Most of the persons sustained injuries when concrete structures collapsed and fell on them, according to her. One body was brought to the Dr Ruth Pfau Civil Hospital Karachi, said police surgeon Dr Qarar Ahmed Abbasi, adding that a tree fell on him near Peoples Chowrangi. According to the Edhi Foundation, among the four people, who died in Karachi due to dust storm-related incidents, three were identified as Tanzeela, 5, a resident of Haji Murid Goth in Gulbahar; Mahak Faisal, 7, a resident of Korangi’s Gulzar Colony; and Kashif, 18, a resident of Landhi. A tree fell on prisons’ van at the City Courts. However, all the prisoners remained unhurt. Similarly, the dust storm also uprooted an electric pole near the main gate of Sindh Governor House, with the result that traffic remained suspended on Aiwan-i-Saddar Road for some time. Due to rough weather, a boat with nine fishermen aboard in the sea went missing. The Maritime Security Agency rescued five of them while four fishermen were still missing, said Pakistan Fisherfolk Forum chairman Mohammed Ali Shah. He said fishermen in five boats had gone for fishing on Sunday night. Of them, four boats returned. Due to gusty winds, one boat with nine fishermen went missing. Five of the nine fishermen were rescued by the MSA while the whereabouts of four others were not known. In Punjab, nine people including two women died in thunderstorm-related incidents. Four deaths were reported in Khanewal district; three in Hasilpur area of Bahawalnagar district; and two Dunyapur tehsil of Lodhran district. In Chitral valley, a woman and two men died when the roof of a house collapsed and fell on them. Showers across the valley had already rendered many houses susceptible to collapse while the roads of Booni, Mastuj, Torkhow, Karimabad, Susoom and other hilly areas have become dangerous due to rock falling.At least nine people including two minor girls were killed and more than 45 injured as strong winds continued to batter South Punjab and Karachi on Monday. The Pakistan Meteorological Department (PMD) predicted rainfall across the country and said the current westerly spell would last till Thursday.